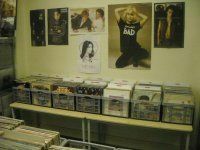 Are you looking for a quality independent record shop in Nottingham? If you want to buy or sell CDs, vinyl records or DVDs, pay a visit to Langley Mill Records. 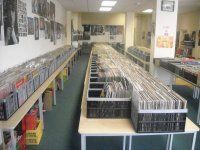 The shop has been established in its present location since March 2009 and is rapidly becoming one of the UKs largest retailers of second-hand vinyl records. 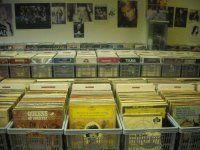 Langley Mill Records has over 250,000 assorted items in stock at present on various formats including LPs, 7" and 12" singles, CDs, cassette tapes, 78s, VHS and DVD videos, box sets, and picture discs. The business caters for all musical tastes and stocks all genres including rock, metal, jazz, blues, classical, rock and roll, gothic, indie, punk, reggae, funk, soul, Motown, soundtracks, country, pre-war, popular 1950's to present, rockabilly, R'n'B, rap, all genres of dance, operatic, compilation albums, folk, religious, comedy and more. All stock is carefully checked visually prior to putting on sale and is easy to look through in comfort..
We also buy record collections for cash as we are always looking for new stock and pay good prices for unusual collections, and will consider all collections no matter how small or large. We have over 250,000 items in stock so are are carrying one of the largest selections of stock in the east midlands, please be aware not all stock is on show at present as some is held in storage and we are constantly refilling the shelves on a regular basis. As we don't sell vinyl online you need to visit in person to see the vast amount of stock we carry.